So, i remember a bunch of us saying over a year ago that all the DD nerfs, CV funkery, and watering down game we would get world of BBs. Just finished a FdG battle with 9 BBs on each side. Upcoming smoke changes going to buff DDs? Might have been fun to be in DD in that game. BB's really arent that much greater a portion of the population, according to the devs only 35%, and they would like it closer to 30%. Using one anecdote isnt that helpful for understanding the big picture, especially when we bring our own biases into it. The new smoke changes will be nerfing the big guns to prevent smoke firing and the Conq is getting nerfed as well. My queue yesterday told me there were 2 CV's, 93 BB's, 4 CL's, and 8 DD's in my range. Fortunately the game I got didn't have that ratio. I assume the free Scharnhorst rental had something to do with that. More like World of bots. I haven't had a game yet today with more than 3 humans. 2 is the average. If I play Monty- I'm the only human. 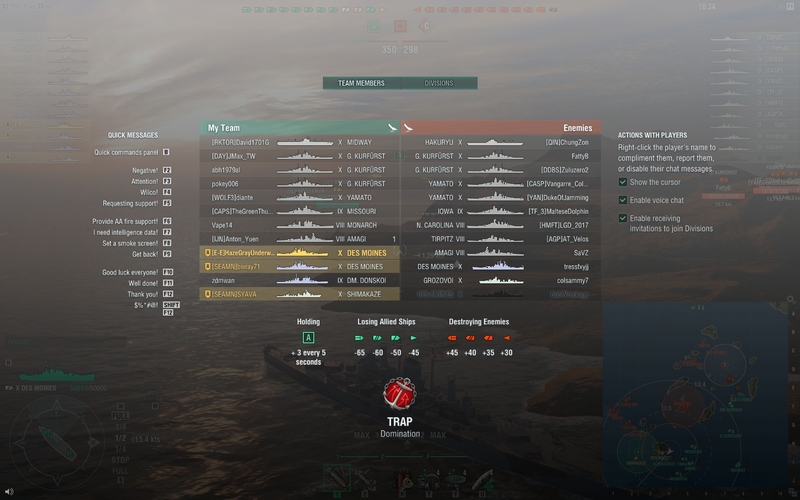 At least they're mainly cruisers, and not all DD's so they tend to survive longer and actually do damage. Even saw some bot BB's! When there ARE humans, most matches I get are fairly evenly split between the classes. You saw bot BB's in Co-op when you were the only human (ie; more than just your matching ship)? Now that would be a change for the better. Most games I've played lately haven't had that many BBs, usually its around 3-6 depending on the game. Nah- it wasn't in any of the Monty games. Still, it was encouraging! At least the bot BB's are a) too slow to suicide charge/ram their counterpart, and b) can inflict some good damage. c) have the health to stay alive for a while. It is a problem depending on tier in particular, it's 35% overall but at T8+ it's been closer to 40 for a while and has recently been breaking that number pretty regularly. (data from u/BeachedWhale1944 derived from MapleSyrup). When you have 40% battleships that pretty consistently works out to five per side at those tiers, cruisers often get three ships a side and when there are 1.6 battleships per cruiser the difficulties of that class increases significantly. You can angle/dodge one battleship, but two is very difficult. The new smoke changes will be hitting some cruisers pretty hard (DM and Neptune in my view will be hurt). They will also ultimately nerf the source of the smoke - why bring a Gearing in a T10 division if the smoke screen utility's going to drop through the floor and smoke is one of the big things going for it? Destroyers are already underrepresented, although not hit by the smoke change themselves directly it's their team utility which will get smashed. WG don't seem to be moving in the right direction on this, according to SEA Group the 0.6.12 patch will see the permacamo for Bismarck and Hood provide an additional service fee reduction bonus. Bismarck is already the most played T8 by about 50% more than the second most (75k games Bismarck, 57k games North Carolina - 2 weeks warships.today). Is that a good move? This was a Tier X match I had last night, so even outside Scharnhorst's MM tier range, it can get like this. The enemy DM made the crucial mistake of being the first, closest thing to be detected, hence his immediate deletion in Cap B. This many BBs in a match, for a Cruiser to do that is inviting instant, early death. I actually understand why he went with the DD to go into Cap B, I've done it before with Cruisers, especially Radar + Hydro Cruisers to massive effect. But you need a DD to drop smoke for you to mask you, otherwise you will ALWAYS be spotted early and get crucified. This DM didn't do that, had no smoke from Grozovoi to give him cover as he went into Cap B, and died instantly as a result. I for one, am very happy about this! No longer do cruisers hunt down my dds, and even better it means I get rediculous damage numbers in my shoukaku. Even my mogami thrives in such an environment, the only loser here is my amagi, poor thing is focus fired since it has a citadel. I'm not thrilled about any imbalance, even the lack of CVs that lets a few of my ships get away with murder. I really think the BBs need to be trimmed back but don't know how - certainly don't like any ship nerfs tho. But, but, but, HE spam is ruining the game!!!! I think the answer to your question is right there in your post. 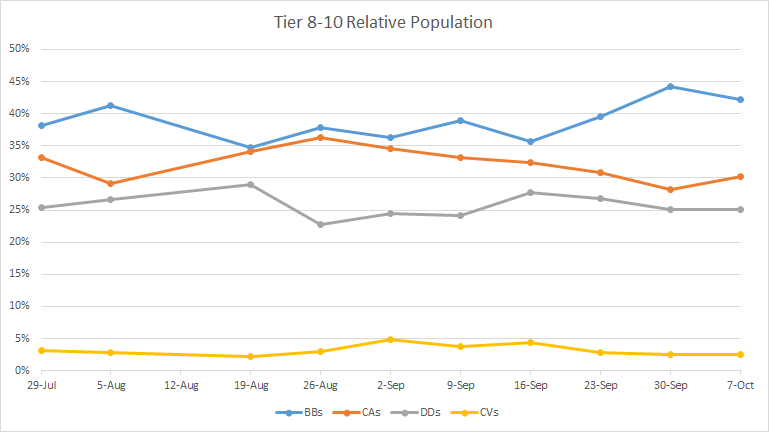 Un-nerfing IJN torps will help some, but I think the biggest change would come from helping increase the CV population, they are the true BB counter imho. - Cut BB AA by 20 - 25% across the board forcing them to actually move up and support cruisers and in return receive defensive fire support or become CV food. Honestly I think implementing the above would balance the classes greatly and BB is my second most played class slight below cruisers and slightly above DDs, with a whopping 130 CV battles under my belt. So I wouldn't exactly benefit from a huge CV buff. When I first started CVs were something to be feared as they should be. In game chat always seemed revolve around who needed AA support and who was covering who in the opening minutes. Now, it's just silence. AA power creep and DD torp nerfs has allowed this to fester out of control. How long have the CV players been waiting for a rework? They rarely get anything in patches that help them, long overdue to show those players some love. 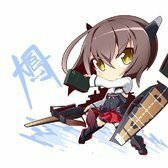 A average of 5-4 BBs in a 12 ships team is far from World of Battleships as many players argue. I would like these changes, but I actually think CVs are fine as is. Sure AA can be tough and low tiers can leave you as an emotional train wreck. But they do a good job at high tiers, where they can really sway a battle in the right direction. What we really need is a WG approved, in game, CV tutorial. I've heard (hearsay so take with grain of salt) that the conq's nerfs are about as effective as the Khab's torpedo nerfs. Doing little to change fire chances or the subterranean citadel. That is an awesome idea. I know every time I get the urge to give them a try- I end up not bothering. Because the game they play is SO different from what the rest of us do, and there's almost no information out there on how to actually play one. I've watched the you tube videos, but they focus almost entirely on manual drops- which you cannot do until tier 6. That, and I learn best by DOING, not by watching videos. An ingame tutorial explaining how to do this, or that etc would be a huge help. Personally, I'm not in favor of nerfing BB AA- at least not US BB AA. (it IS supposed to be our flavor after all) I think it would just cause even more rage and frustration. As a North Carolina/ Alabama/ Montana driver, my ship is literally COVERED in AA guns- they WILL to leave a mark if you stray too close. Just think of it as a backloaded tax for all those matches in the low tiers where you trolled BB's with garbage AA mercilessly. Oh no. I take all the flak from teams who hate me since I run strike to give them the best chance of winning, since I found that when I focus on damage, we win more. You guys have to remember who controls WoWS. It's WG who started with WoT. Who does WG listen to? The RU servers who want the Heavy tanks to rule. Is not WoWS played more population-wise in Russia than even in Europe or Asia? We all know NA is the afterthought. Oh my god I hate 10 BB matches SOOOOOOOOOOOOOOOOOOOOOOOOOOOOOOOOOOOO MUCCCCCCCCCCCCCCCCCCCHHHHHHHHHHHHHHHH!!!!!!!!!!!!!!!!!!!!!!!!!!!!!!!!!!!!!!! Every match is a 10 BB match now. 1 in 5 has less than 10 BBs at the higher tiers, and it totally screws cruisers. To me the obvious fix is make CVs better and trim down AA on BBs. That should help keep the population under control a bit. Unlike arty in WOT, CVs make the game better, not worse. The other option would be to cap BBs at a max of 4 per side, but that will induce whining to high heaven. Where do you guys find these matches, I would love to trade places with you guys.